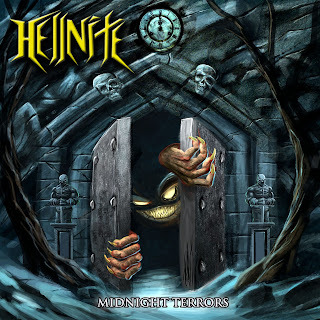 Thrashers HELLNITE have unleashed their second single "Phantom Force" off their forthcoming debut full length "Midnight Terrors" slated for release February 12, 2019, on Sliptrick Records. The track refers to the term “paralyzed dreams” where a person is awake/asleep and their body is physically paralyzed, but their mind is conscious. It is also known as a term for those who are superstitious and believe the body can suffer a spiritual possession by an evil entity while being awake yet numb. Vocalist/guitarist Paolo Belmar said, "'Phantom Force" is basically about the fear of being possessed by that dark spirit. It represents that fight between you, your body and the spirit trying to possess it, the outro of the song is trying to achieve a progressive sound to compliment that sentiment." Formed originally in Mexico City in 2010 and now re-established in Edmonton, Canada by founding member, vocalist, and guitarist Paolo Belmar, HELLNITE's debut album was written and recorded by Belmar who is now joined with a live line up consisting of bassist Konnor Miskiman and drummer Ryan Payne. The full length is lyrically a paranormal and sci-fi themed concept album with influences from classic heroes such as Kreator, Slayer, Death along with next-generation thrash and heavy metal such as Havok, Skull Fist.